James Baillie from butchers, T Baillie & Son, has been crowned the 2012 Scottish Black Pudding Champion. 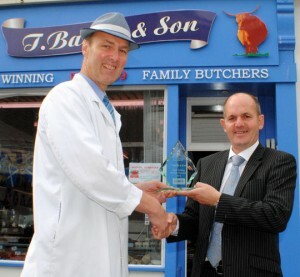 Harry Simpson from Dalziel Ltd presented the Dockhead Street butcher with his trophy. This competition organised by the Scottish Federation of Meat Traders attracted almost 100 entries. It was judged regionally with the Regional winner from each of the five heats both going through to the Scottish Final. The five finalists were then visited when their products were purchased by mystery shoppers and taken away for final judging.